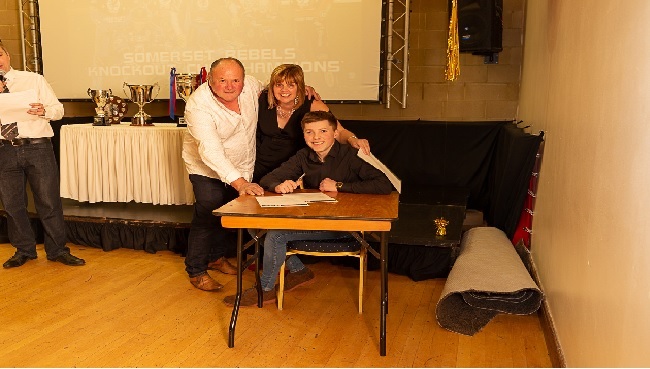 The 'Cases' Somerset Rebels will have one of the youngest reserve combinations in the SGB Championship following the confirmation that 17 year old club asset Henry Atkins will take his place for the 2019 season. Henry, who became a Rebels asset at the club's end-of-season presentation evening earlier this month, will have turned 18 by the time the curtain rises on the club's 20th Anniversary season and he will link up with fellow teenager Anders Rowe at the tail end of the Rebels team. A former club mascot, Henry's first break in team racing came with Coventry at third tier level in 2016 and for the past two seasons has been gaining valuable experience with the Plymouth Devils in the National League and it is his progress that has persuaded Garry May to offer him a team spot for 2019. "Obviously, with our connections with Henry over the years we have been monitoring his progress and we felt that he is now just about ready to move up in class and with us stepping down to the Championship this season it seemed to be a perfect fit. I know some people will raise their eyebrows with us having such a young duo at reserve but the league itself is going to be something of a leveller with only 38 points to play with and that does open the doors for these youngsters to test themselves. With the experience of Rory and Bomber to call upon I believe that both Henry and Anders will benefit from that . Somerset have now confirmed five of their starting line-up for the 2019 campaign and May is hopeful of being able to declare the remaining two positions by the end of the month.